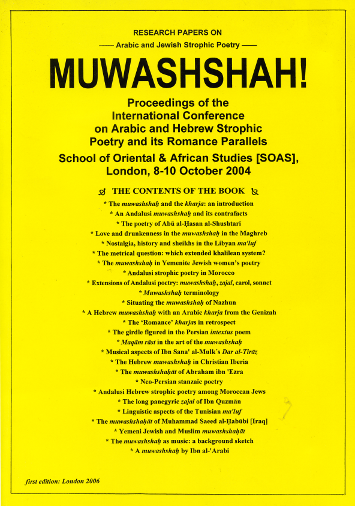 Otto Zwartjes, "The muwashshah and the kharja: an introduction"
Karin Almbladh, "An Andalusi muwashshah and its contrafacts"
Lourdes Maria Alvarez, "Reading the mystical signs in the songs of Abu al-Hasan al-Shushtari"
Saadane Benbaabali, "Love and drubkenness in the muwashshah as sung in the Maghreb"
Federico Corriente, "The metrical question in Andalusi stanzaic poetry: which extended khalilean system?" Dina Dahbany-Miraglia, "The muwashshah in Yemenite Jewish womend's poetry"
Carl Davila, "Andalusian strophoc poetry between the spoken and the written: the case of the Moroccan Andalusian music"
Ed Emery, "Temporal and geographic extensions of Andalusi strophic poetry: muwashshah, zajal, carol, sonnet"
Mohamed Zakariyya Enani, "He desires her? Situating Nazhun's muwashshah in an androgynous aesthetic of courtly love"
Ulf Haxen, "A Hebrew muwashshah with an Arabic kharja from the Genizah"
Richard Hitchcock, "The 'Romance' kharjas in retrospect"
Angelo Michele Piemontese, "The girdle figured in the Persian intextus poem"
Anna Plakhova, "Maqam rast in the art of the muwashshah"
Dwight Reynolds, "Musical aspects of Ibn Sana' al-Mulk's Dar al-Tiraz"
Arie Schippers, "Some remarks on the muwashshahat of Abraham ibn Ezra"
Gregor Schoeler, "Neo-Persian stanzaic poetry and its relationship to the Arabic musammat"
Edwin Seroussi, "Andalusian Hebrew strophic poetry in the religious musical repetoire of the Moroccan Jews"
Michel Sleiman, "The long panegyric zajal of Ibn Quzman: a statistical approach"
Kathryn Stapley, "Linguistic aspects of the Tunisian maluf"
Menashe Tahan, "A brief introduction to the muwashshahat of the Iraqi poet Muhammad Saeed al-Habubi"
Yosef Tobi, "Yemeni Jewish and Muslim muwashshahat"
Owen Wright, "The muwassah as music: a background sketch"